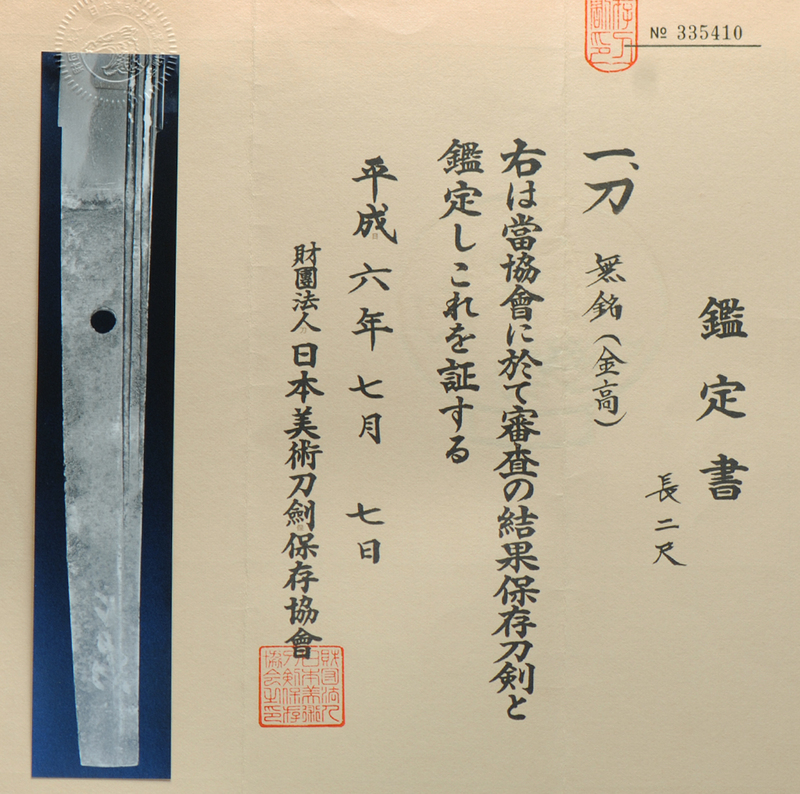 A very interesting sword made by Kanetaka. 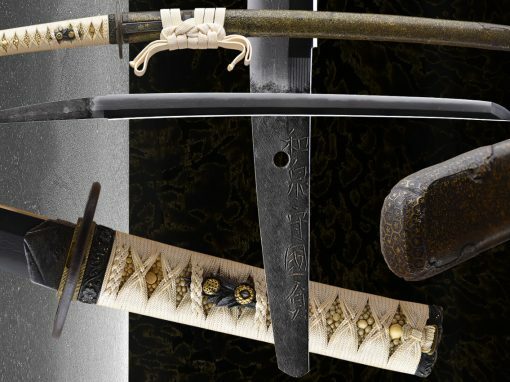 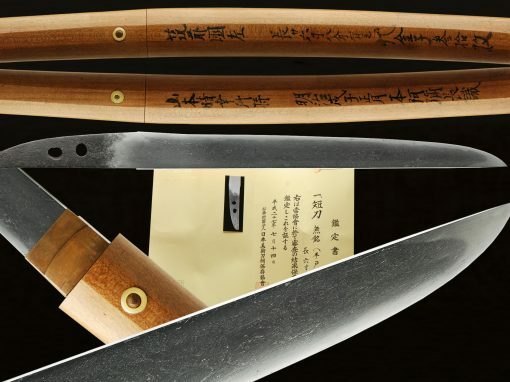 This katana has a wonderful hamon that is very lively and loaded with hataraki/activity. 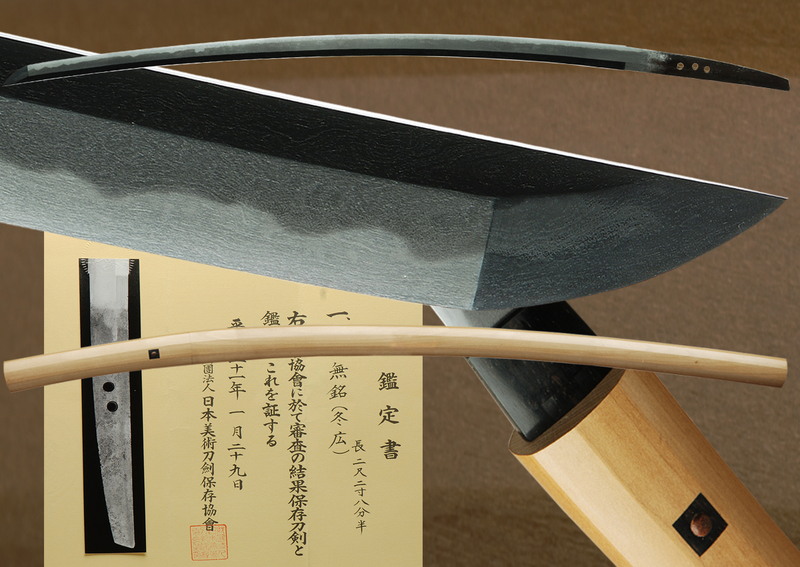 The mixture of the activity and overall balance in this hamon make it a very fine example of Kanetaka work. 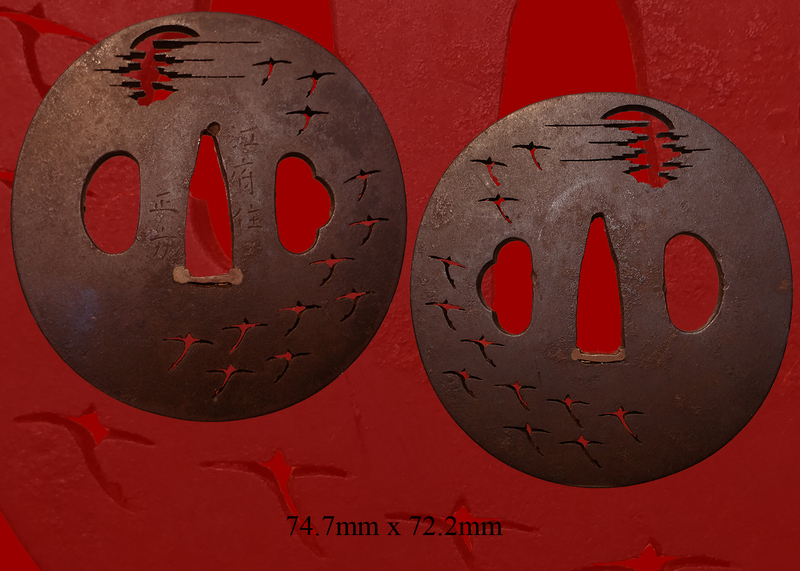 You can find much ji-nie and temper in the ji area. 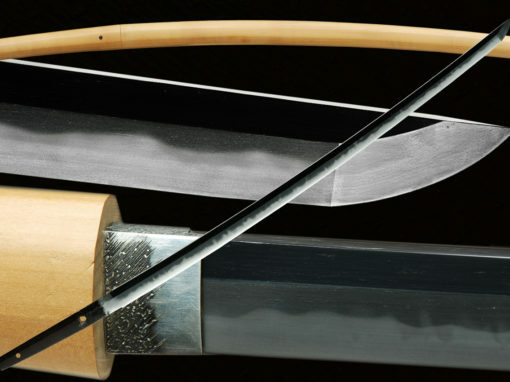 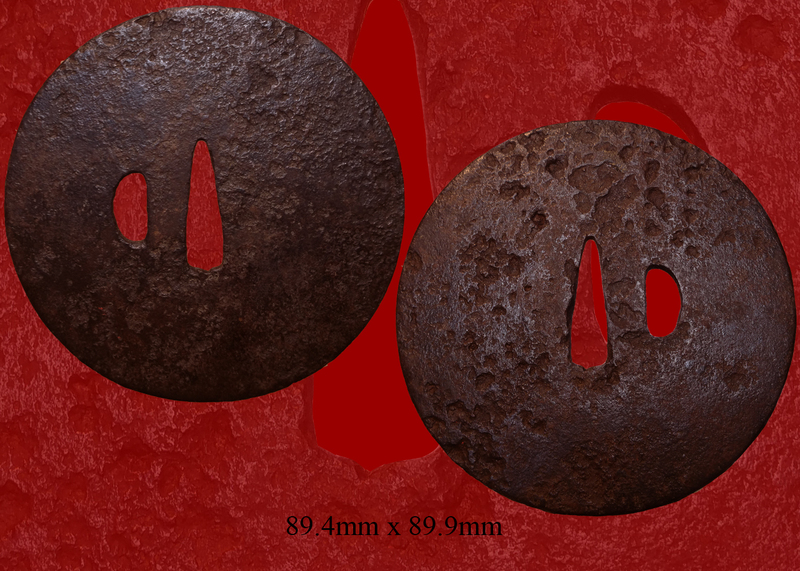 Its very difficult to give a good example of the hamon in the pictures because of the older polish. 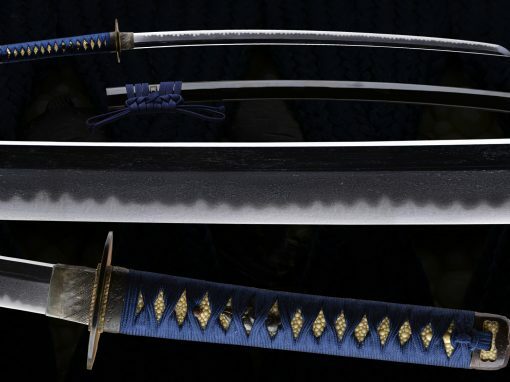 I can only say that in hand its much more beautiful than the pictures can show. 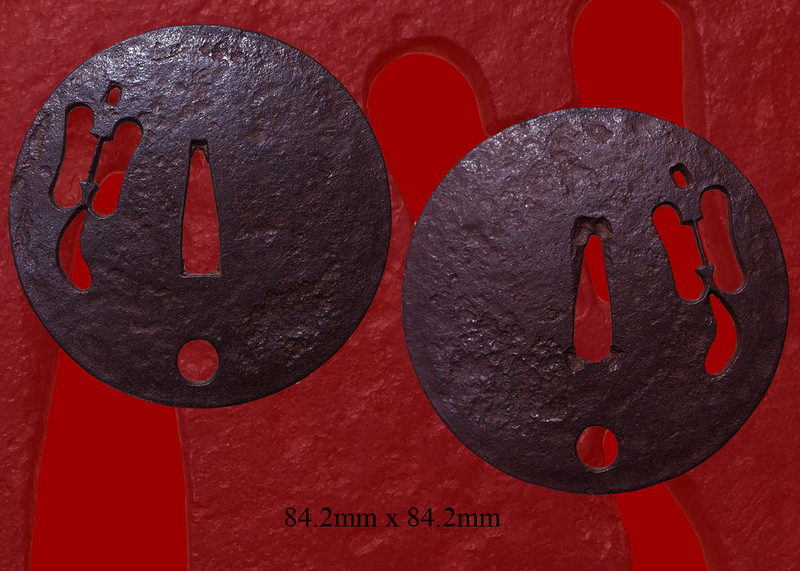 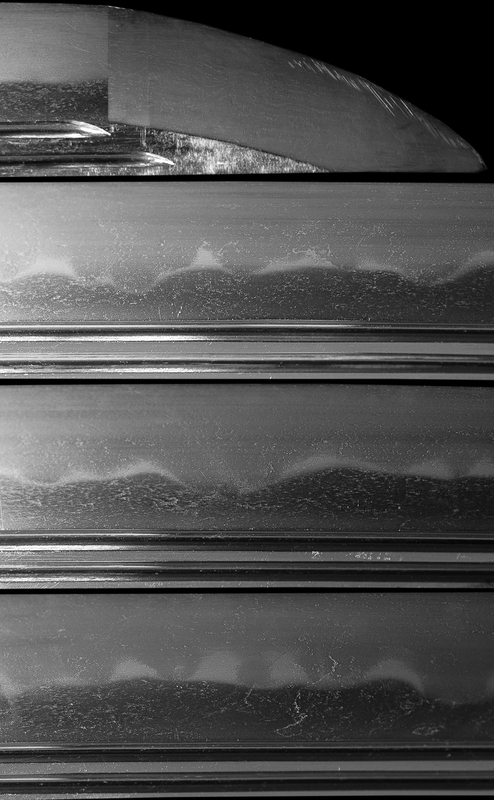 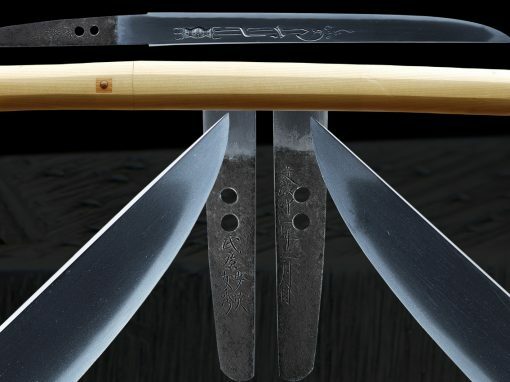 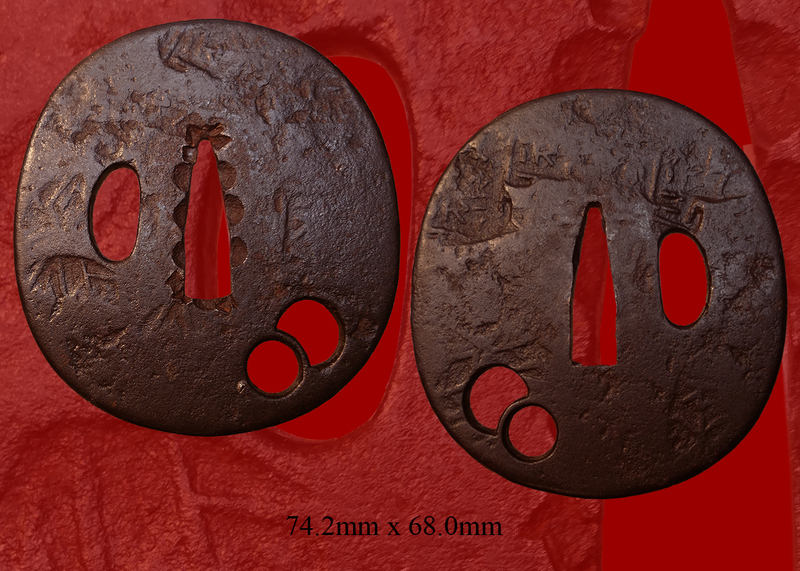 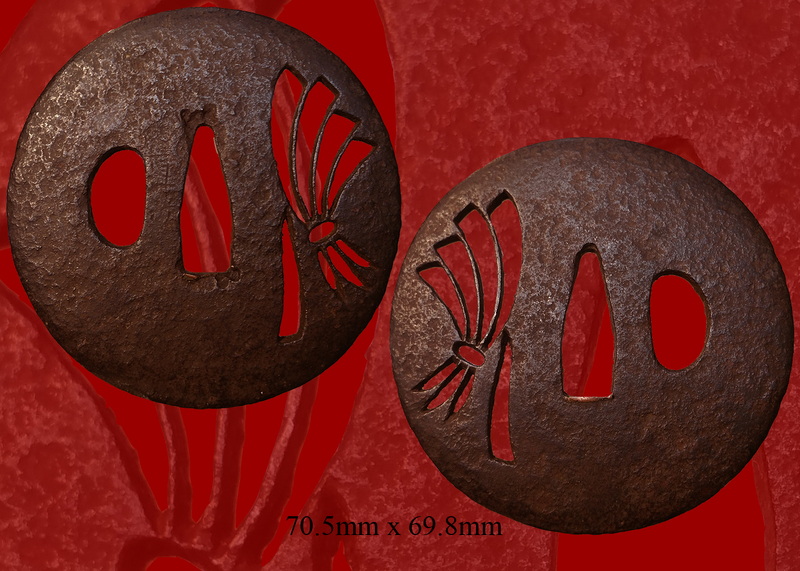 The hada is ko-itame and is very well forged and has no flaws. 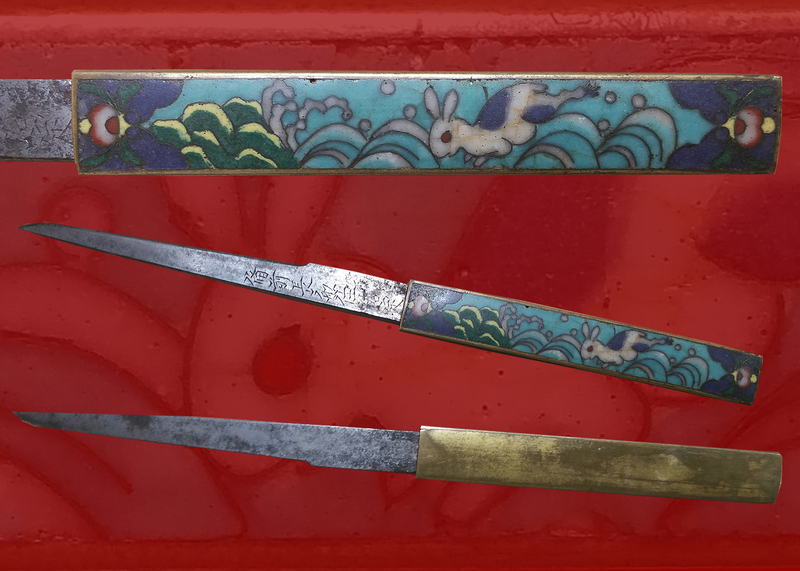 This katana is in an older polish with some scuffing but has no serious rust. 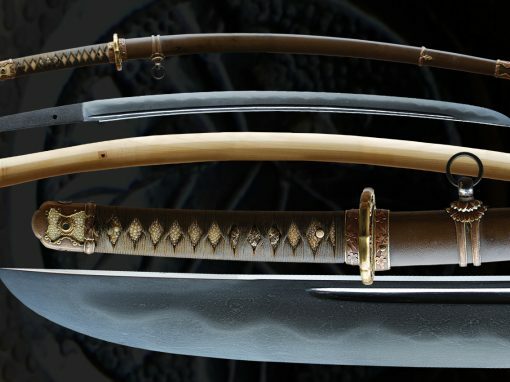 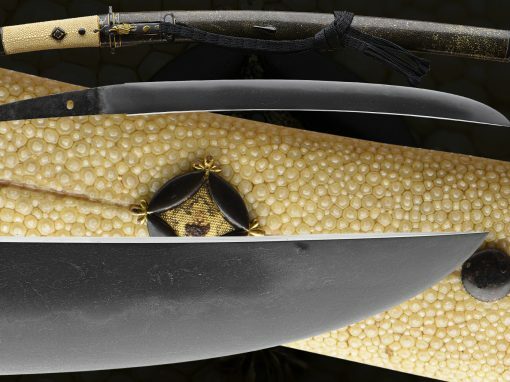 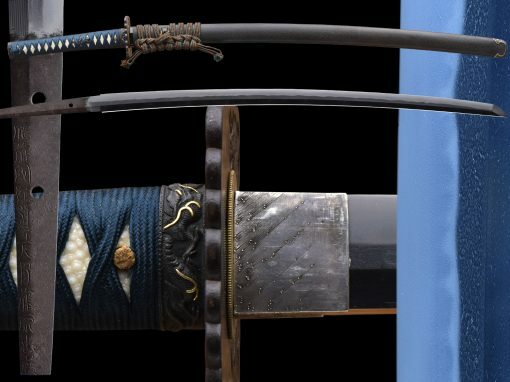 As for the mounts/koshirai, they are original to the sword. 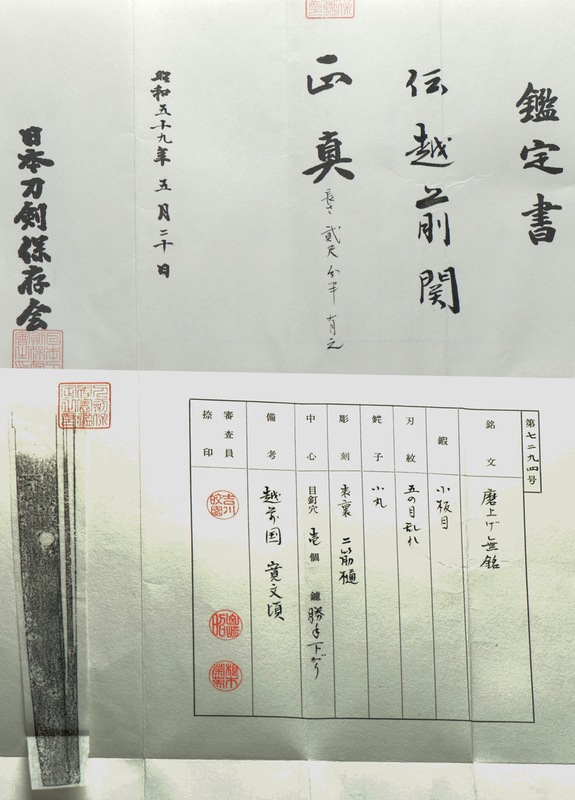 They came directly from the WWII effort. 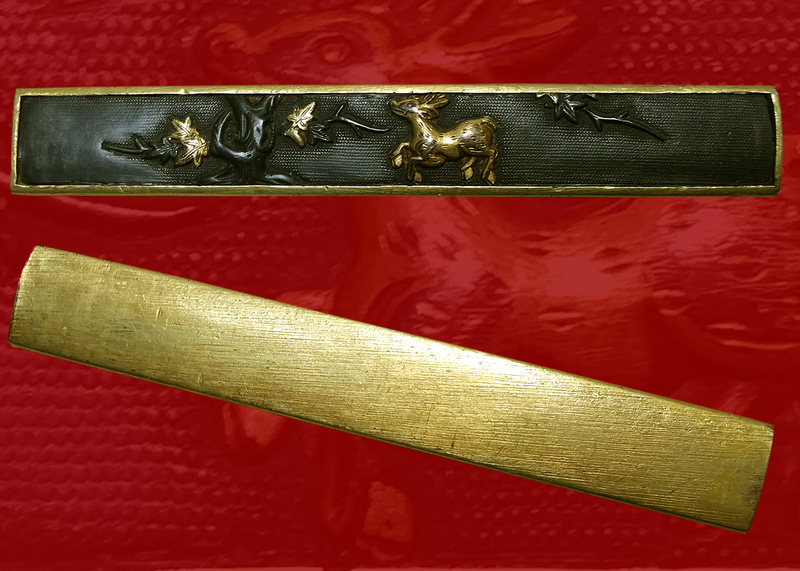 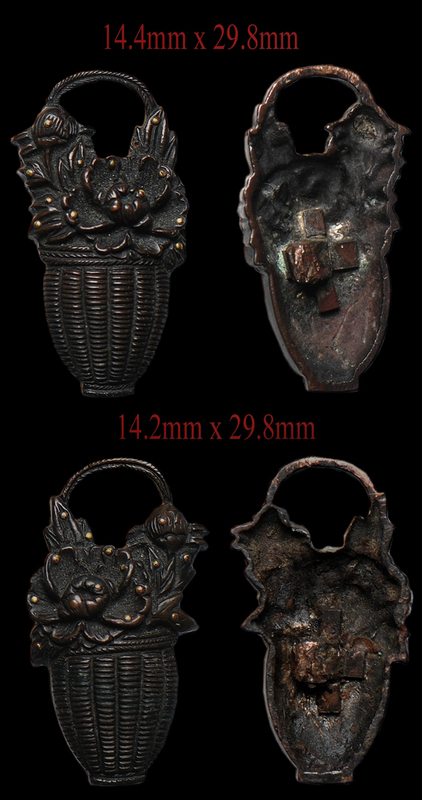 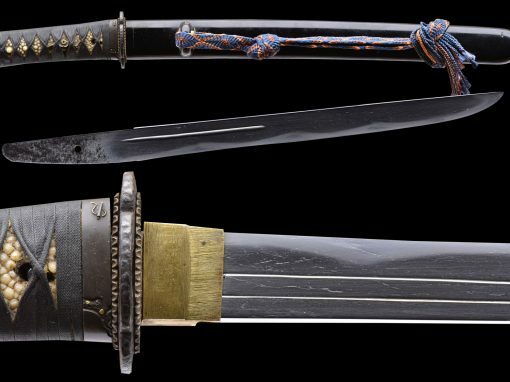 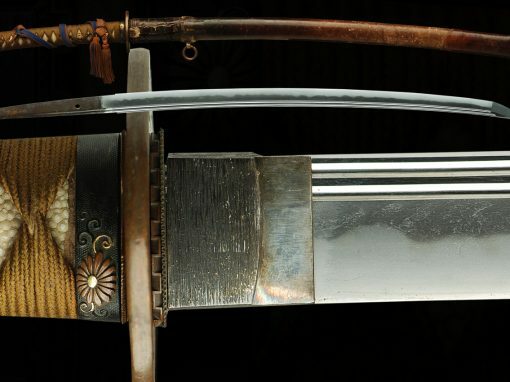 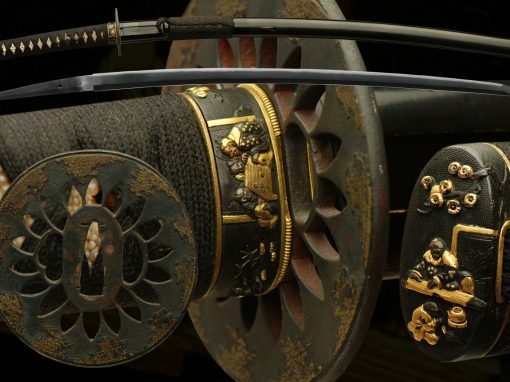 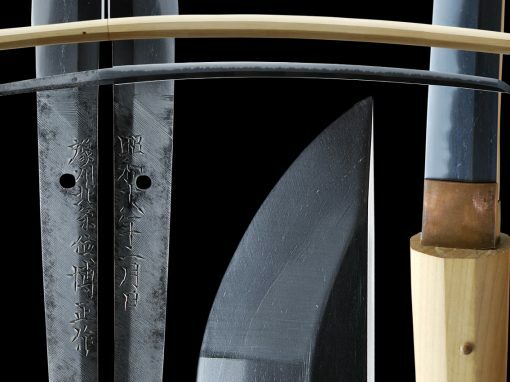 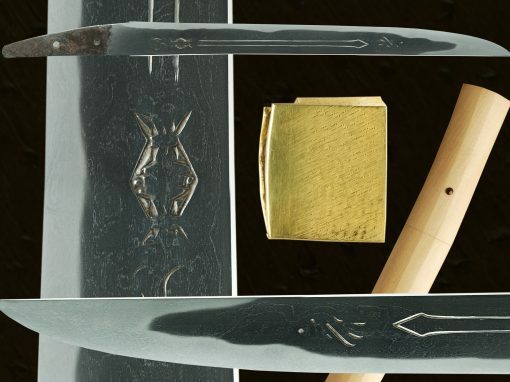 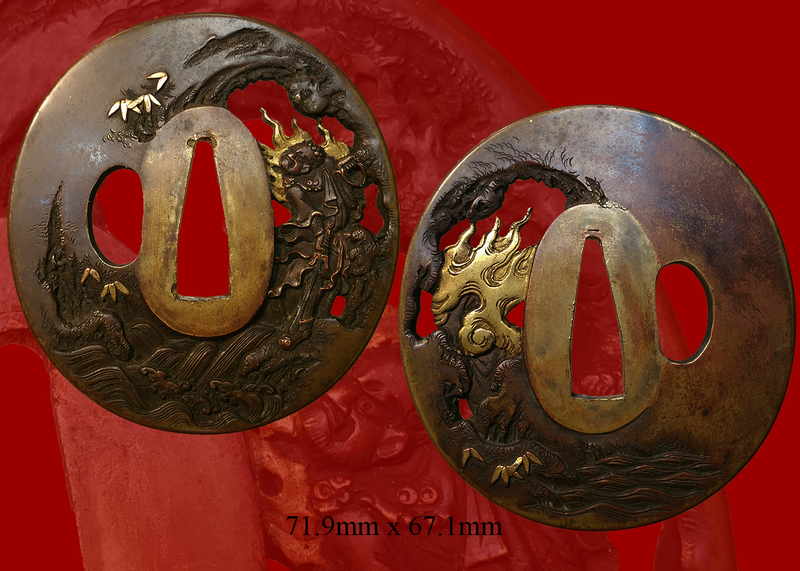 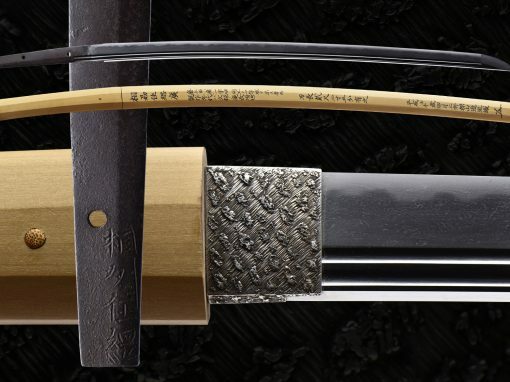 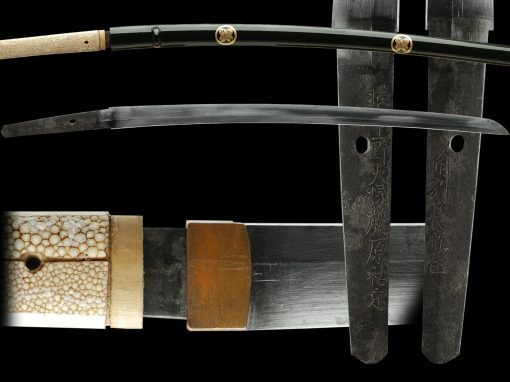 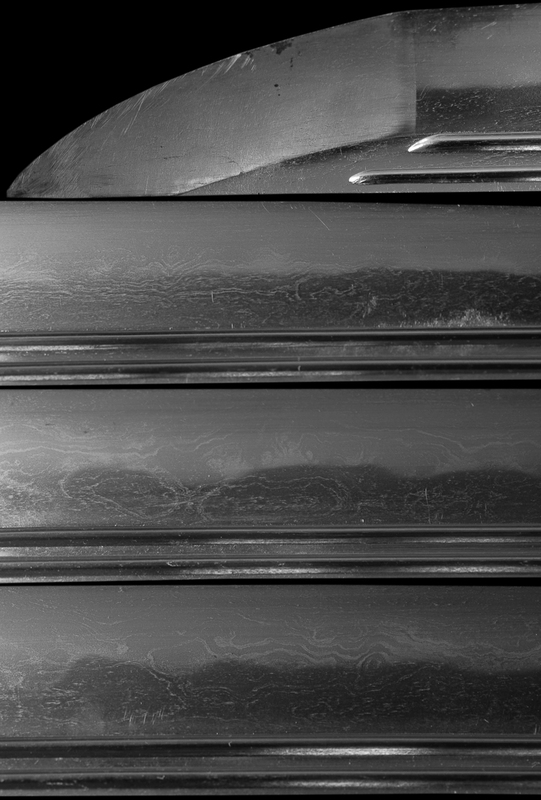 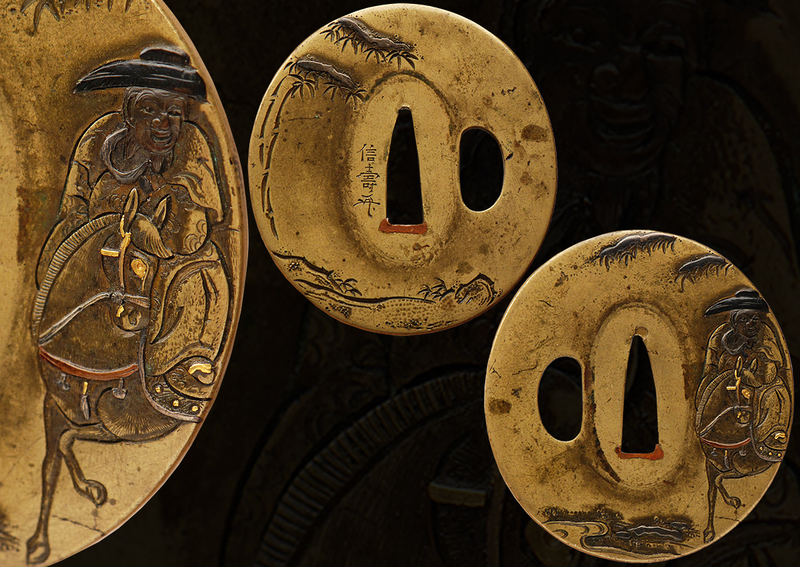 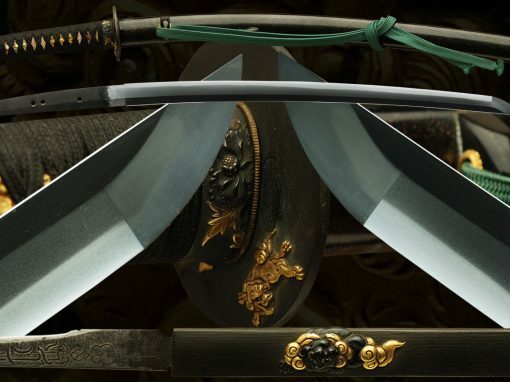 The handle is obviously the older katana handle with it’s fitting that date back over 100 years to the Edo era. 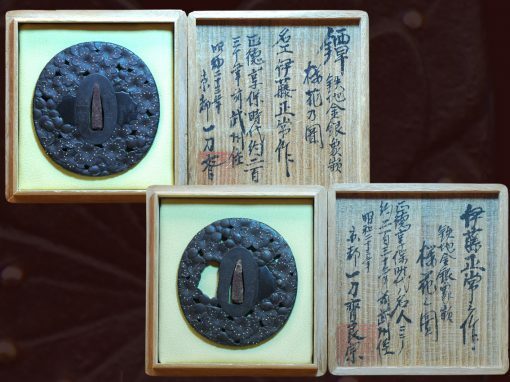 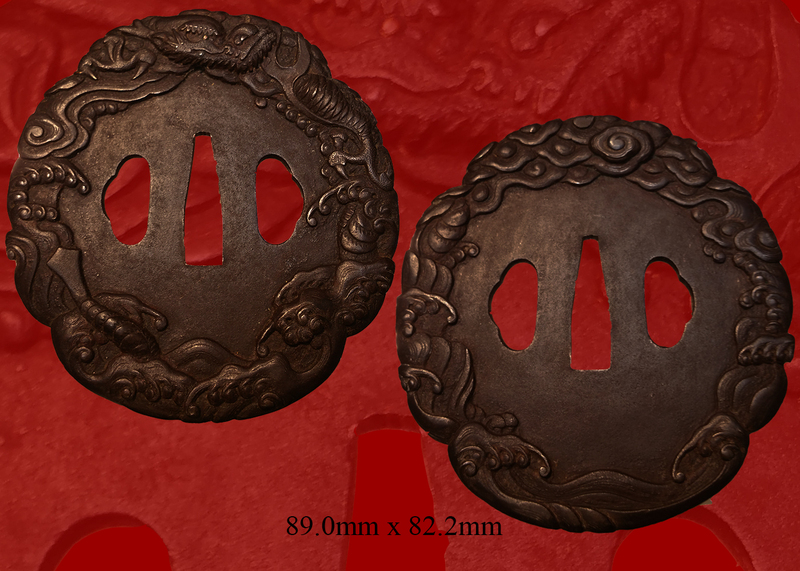 The habaki is of copper with silver foil covering. 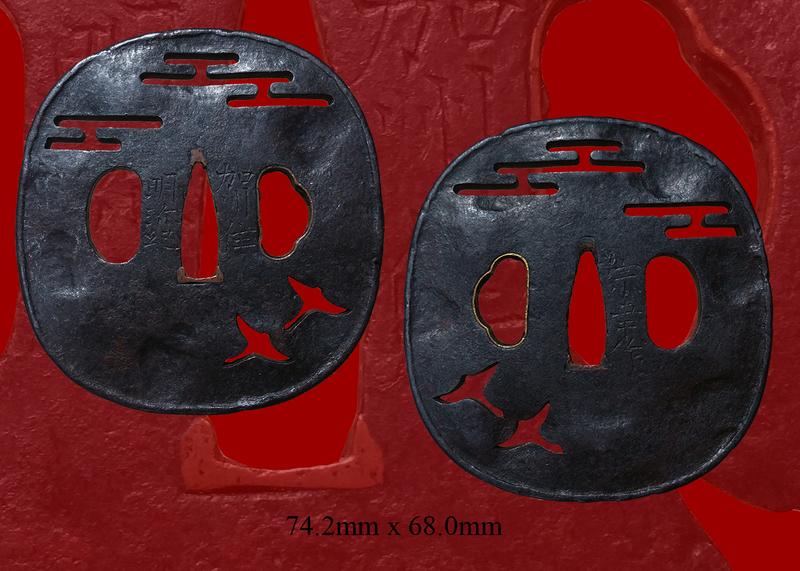 These mounts were used and adapted to be carried during WWII. 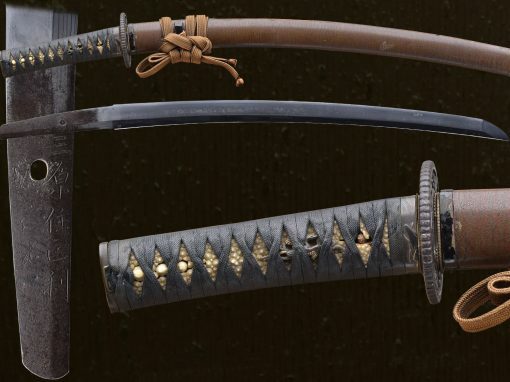 It’s a unique mount and very interesting to see the transition from the older fitting to the adaptation for the war. 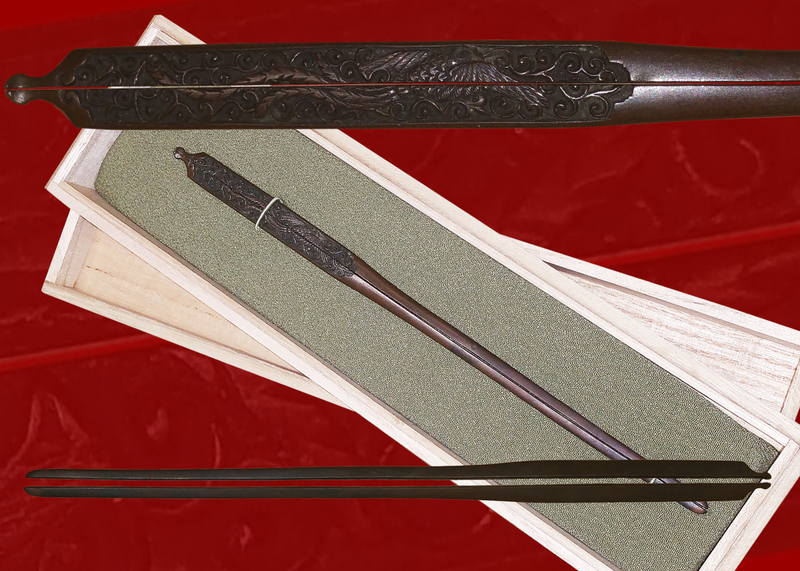 The saya was covered with leather to protect the older lacquer. 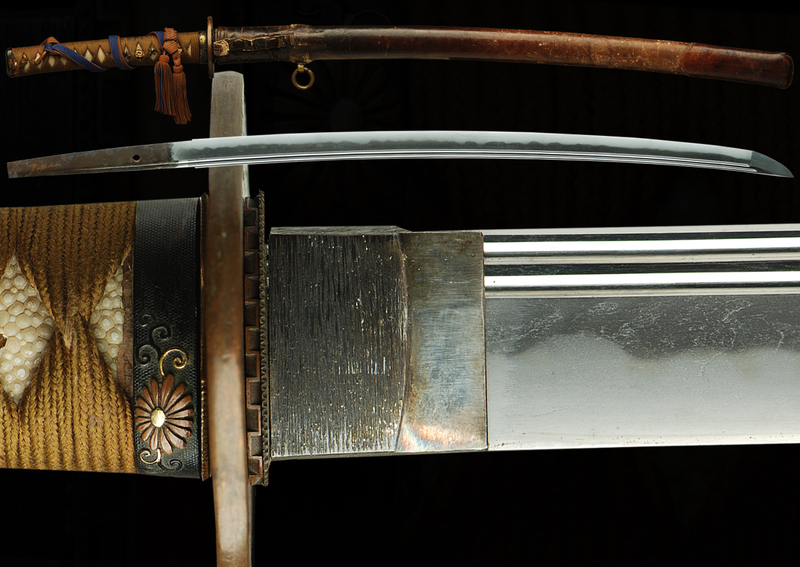 The cover still has its strap and buckle, to hold the sword tightly in its scabbard. 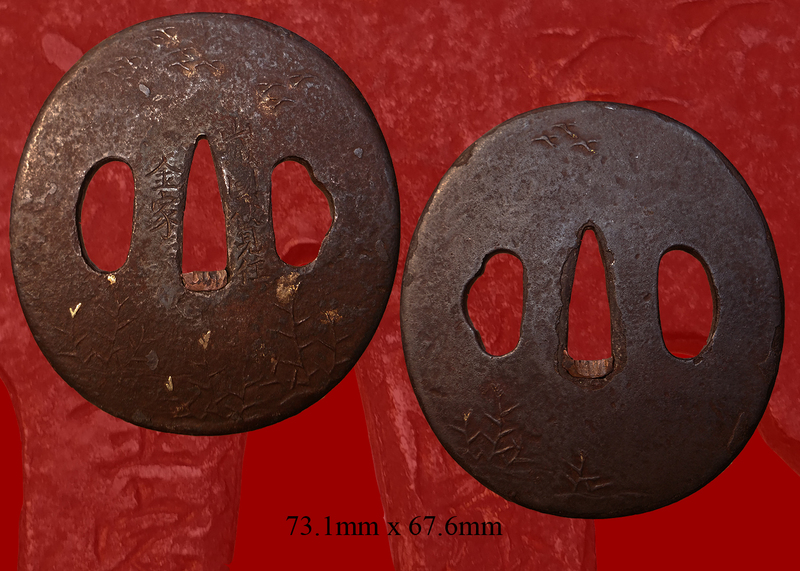 A hanger was also added in copper with a tassel. 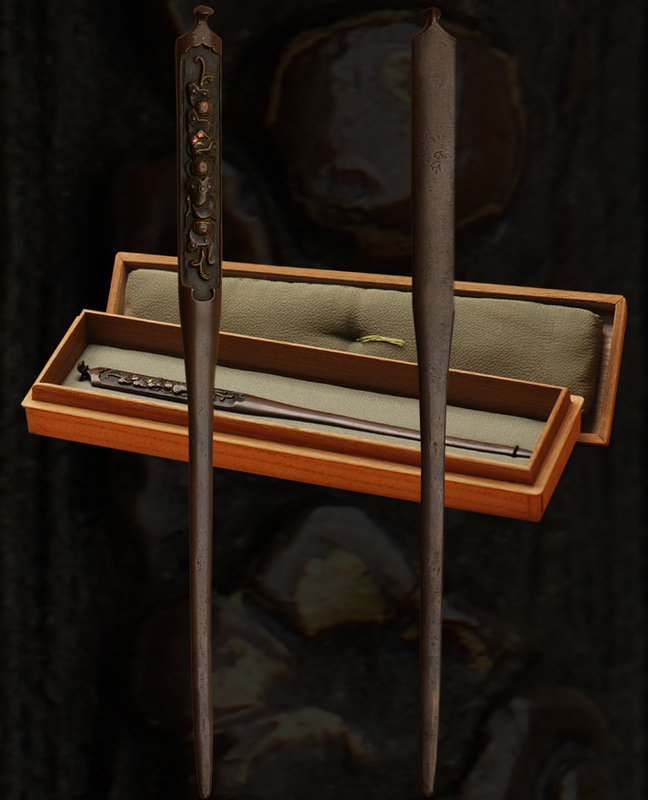 I find these mounts extremely collectable, there unique transition from older to newer adjustment for the war is fascinating. 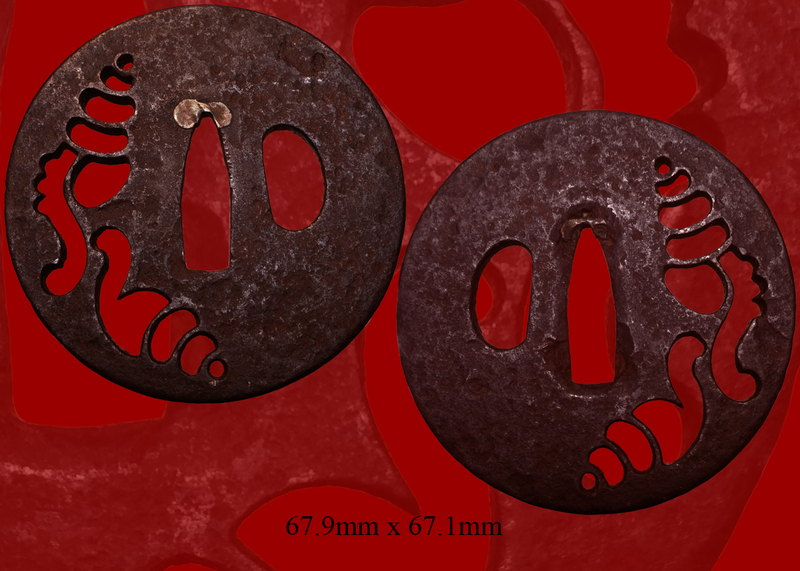 Email us if your interested in this item and remember to include the order number for this item: fss-805.